In a unique choice of food names, Wendy’s — the "home of bacon" — recently announced the arrival of the "Son of Baconator" hamburger. The name, combined with the sheer carnage inherent in this beefy bacon-laden burger, definitely make it terrifying — but is it terrifyingly delicious, too? If you like the original Baconator (who doesn’t? Nobody, says Baconator), the answer is probably yes. It’s basically the same burger, only a wee bit down-sized. Daddy dearest "Baconator" was getting up there in age, so it was about time he pushed his bacon-y spawn into the Wendy’s spotlight. The young’un is "not to be taken lightly," (nor called "Junior"), Wendy’s says, with its four strips of applewood smoked bacon, two 2.25-ounce patties of fresh beef, two slices of American cheese, ketchup, and mayonnaise atop a buttery toasted bun. Son still has some growing up to do; Pops the "Baconator" still tops him with double the burger and six slices of bacon. 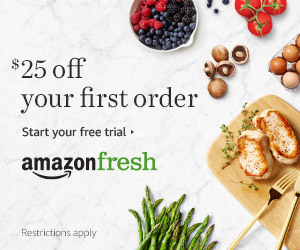 The new family member means now "consumers can decide how big they want to go," said Wendy’s chief marketing officer Craig Bahner in a press release. We can also thank Wendy’s for bringing dads and sons everywhere a little bit closer together. There’s no manlier form of father-son bonding than sharing a meal of beef-and-bacon in custom-tailored proportions. Even though Son of Baconator (and us) may never know who his mother is, we think he’ll do just fine. Heads up for bacon-cheeseburger fanatics: Wendy’s is looking for bacon-frenzied bloggers to write reviews of their burger-tasting experience. For your prose, you could win a gift card and get the chance to become "Baconator Approved blogger of the week". 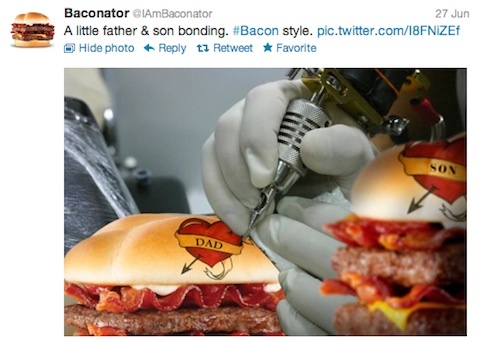 The proud father Baconator himself is a bit of a wordsmith. Here are some gems from his rather witty Twitter. No dad jokes here.